Featuring aptX LOW LATENCY and Optical TOSLINK connection, the Miccus Home RTX Mini is an audiophile’s wireless solution. High resolution with 32ms or less of latency means that you won’t notice its wireless. With the 2 in 1 flexibility of a Transmitter or Receiver, find out just how good your TV or stereo can sound. The Home RTX mini seamlessly transforms your TV, Speakers or home AV into a low latency Bluetooth wireless powerhouse! * High-fidelity Bluetooth v4.1 audio Transmitter or Receiver with support for the aptX Low Latency codec. 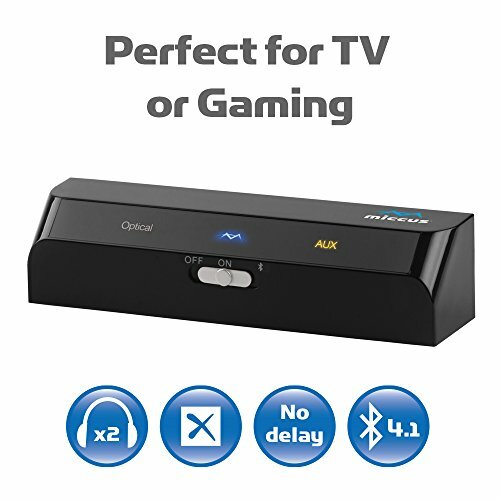 * Bluetooth Transmitter (TX) Mode - Connect the RTX mini to your Television or Home audio equipment and use it to wirelessly stream music to any Bluetooth headphones, speakers or receivers. * Bluetooth Receiver (RX) Mode - Connect the RTX mini to your Stereo, Speakers or Home AV gear and wirelessly stream music from your iPhone, iPad, PC or Bluetooth transmitter. * Dual-Link means that the Home RTX mini can pair or stream with 2 devices at a time. NOTE: When dual-link is enabled it is NOT Low Latency mode. * 3.5mm or Optical Audio Connections NOTE - Optical supports PCM, LPCM and Dolby DTS 2.0 it does not support multi-channel formats such as 5.1, 7.1 etc. * Nothing to charge - The Home RTX Mini is powered by USB which means if connected to your TV USB it will turn on and off with the TV. * Audio codecs: SBC, AAC, aptX, aptX-LL, NOTE aptX-LL requires both devices in a pairing to support the aptX-Low Latency codec. * Operating range: up to 33 ft (10 M), Operating Frequency: 2.4 GHz. * Power Input 5V DC 500mA, Dimensions 99.6*23.6*23.6mm, Weight 25g. * Velcro mounts for discreet attachment behind your TV or Stereo. * 2-Year No Hassle Warranty. Contact our in-house customer service at +1 (616) 604-4449 and we’ll get you squared away. * Friendly and knowledgeable - If the need should arise; our Customer Service reps are Jedi masters at speaking and writing the English language and will work with you to solve a problem. * Support by phone available Monday-Friday, 11am-4pm EST +1 (616) 604-4449; email support and knowledgebase available 24hrs. EASILY UPGRADE YOUR SYSTEM TO WIRELESS - Add the lastest Bluetooth technology to your current home theater, multimedia, PC, or stereo & enjoy cordless freedom without big costs. Featuring: Optical TOSLINK, multi-point, aptx Low Latency, 2 in 1 modes. USE YOUR BIG SPEAKERS FOR MORE CONTENT - Why struggle to hear audio from your phone? Connect the Mini to your speaker system & listen to podcasts and music from your phone or tablet. Use your phone to control the speaker audio from across the room. If you have any questions about this product by Miccus, Inc., contact us by completing and submitting the form below. If you are looking for a specif part number, please include it with your message.